Especially for the users who moves from desktop to laptop feel inconvenience operating it as lack of numeric keypad or numpad on the Key board, many users who does accounting and numeric oriented programs need to do operate with long sequence numbers mostly lags at their work due to unsupportive hardware settings. Also the computer gamers feel uneasy in operating this kind and space consuming problem occurs if alternate step is taken, but Adesso alternates it apt in comforting the users in this problem with dual functional 19 Key USB Numeric Keypad. 19 Key USB Numeric Keypad offered by Adesso, combination of a numeric keypad and an optical mouse of 4.752? x 2.25? x 1.5? 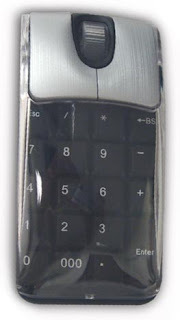 in dimensional optical mouse, 1000 dpi resolution, the user can use it for mouse function when needed and also keypad when the needed to enter quick numbering data’s by just flipping up the transparent cover outer and operate with numeric keypad for instant work which automatically increase the productivity and again when keypad is not needed flip down the cover to avoid touching the numeric keys unknowingly or what else while using mouse functions. • USB Cable Length: 60"
Adesso 19 keys USB Numeric Keypad costs $27.99.